Status Bar. The Status Bar displays information about the Console Window. Mouse: The Mouse display shows the position of the mouse cursor in pixels relative to the upper-left corner of the Console Window. Color: The Color display shows the red, green and blue color components of the pixel under the mouse cursor. Char Pos: The Char Pos display shows the character cell position of the mouse cursor. $0, $1, $2, $3, $4, $5, $6, $7, $8, $9, $A, $B, $C, $D, $E, $F, $10, $11, $12, $13, $6A, $100, $101, $102, $103, $104, $105, $106, $107, $108, $109, $10A, $10B, $10C, $10D, $10E, $10F, $110, $111, $112, $113, $114, $115, $116, $117, $118, $119, $11A, $11B, $130, $131, $132, $133, $134, $135, $136, $13D, $13E, $145, $146, $14A. Click here for a complete description of all the CGA, EGA, VGA, and VESA modes, There is also detailed information about the VGA paletted modes. Keyboard Input. 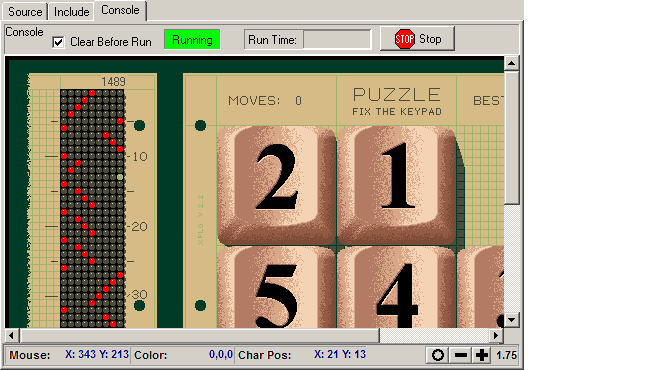 The Console Window also provides keyboard input for XPL programs. Whenever the Console Window has the focus, keystrokes are directed to the XPL input intrinsics. Standard XPL device channels and intrinsics receive keystrokes just like they do in DOS. Mouse Input. Anytime the mouse cursor is within the Console Window, the cursor position and the mouse button state can be read by the XPL program. Mouse information is read with the extended intrinsics. Screen Refresh. The Console Window is refreshed at regular intervals and after every operation that makes changes to the screen. It takes about 300 microseconds to refresh the screen. Although this is very fast, controlling Screen Refresh can speed up certain operations. Click here for more detailed information.